Line 6 clocked 30 million working-hours without LTI. 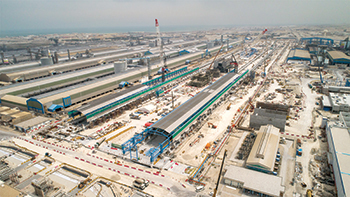 Aluminium Bahrain (Alba), soon to be the largest aluminium smelter in the world, announced that it has successfully started 106 pots in Line 6 on March 26. Line 6 comprises 424 pots and that leaves 318 pots to start-up in the coming months, the company said. Speaking on this occasion, Alba board chairman Shaikh Daij bin Salman bin Daij Al Khalifa said: “We are pleased to have safely started 106 pots which equates to 25 per cent of Line 6 capacity. Our next milestone is to reach 50 per cent by the end of April and we expect full completion of Line 6 in early Q3 2019. The Line 6 Expansion Project will make Alba the world’s largest aluminium smelter, by boosting its per-annum production by 540,000 tonnes, bringing total production capacity to 1.5 million tonnes per year. Alba also achieved a major construction safety milestone last month by clocking 30 million working-hours without Lost Time Injury (LTI) at its Line 6 project.